A lot of times I find the simplest games the most entertaining. If the game is fun, has a nice interface, and can be played in short bursts of three to five minutes, then it is a game I will definitely check out. ‘Starts With Ends With’ is a game developed by J. Tagmire and fits my criteria perfectly. 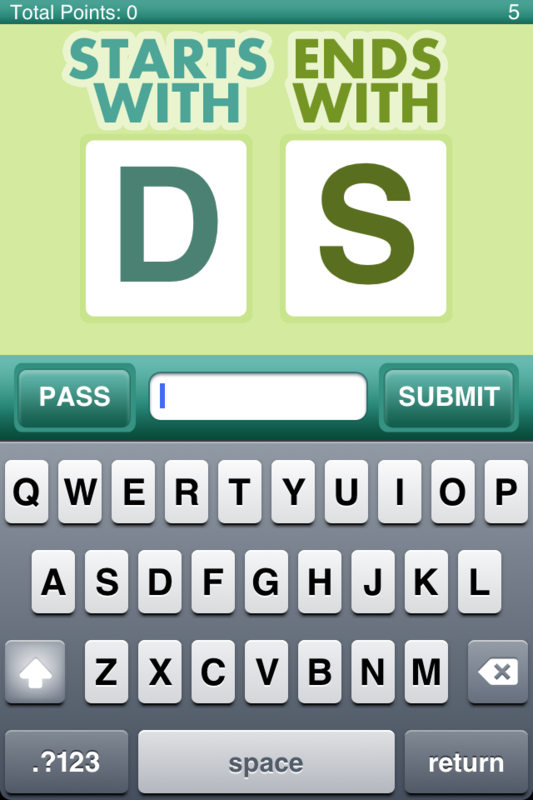 The goal of the game is to create the longest word possible with the starting and ending letter you are provided. 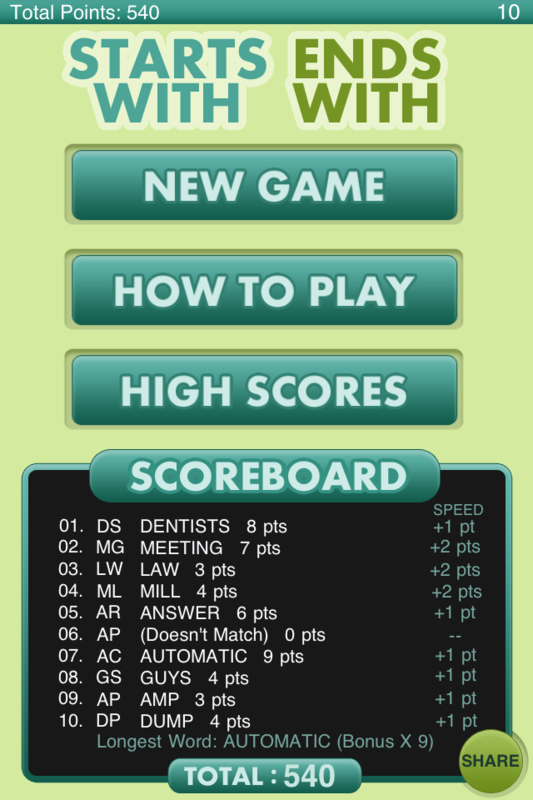 You get points for each letter in the word you create and additional points for being fast with your thumbs. 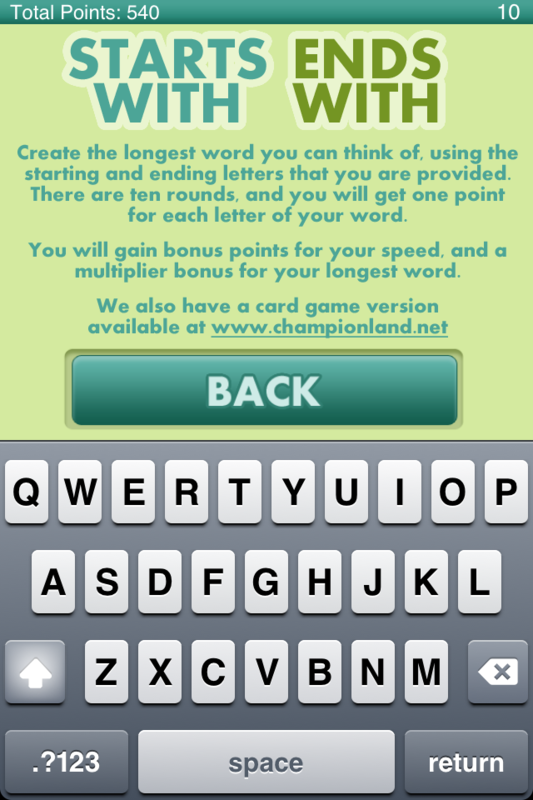 A bonus of 10x is given for the longest word and is awarded once you complete all ten rounds. The game is pretty straigtforward and easy to get into. One thing I wish it did was mark the words that are not words instead of replacing them with (not a word). There were a few times I swear the word I used was spelled correctly but it is impossible to verify since it doens’t list ones it marks this way. This would also allow players to report any mistakes to the developer and have them corrected. Starts With Ends With also has integration with the Game Center where you can check out how you compare to other players around the world via a leaderboard. In addition to that you can also either brag or embarass yourself by sharing your scores on Facebook, Twitter, and Tumblr. Not much to say about the interface, it is easy on the eyes and simply works for the purpose of the game. In this day and age of people wanting to customize everything it may be nice to be able to choose from some different color schemes. Other than that I don’t see much to improve as far as the interface goes. I also think it would be cool if the developer added multiplayer functionality so you could go head-to-head with a friend and see who has the best vocabulary, or spelling skills, or luck. Starts with Ends With is not only fun, but it can help you expand your vocabulary. 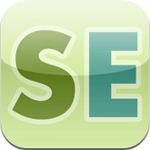 Broaden your horizons and buy this app, you will be addicted before you know it.